Students from three Brooklyn neighborhoods interviewed their local small business owners to find cross-neighborhood trends. High schoolers in the Brooklyn College Community Partnership (BCCP) program at Paul Robeson (Crown Heights), New Utrecht, and Bushwick High Schools interviewed the owners of 99-cent stores, barbershops, and gift shops in their respective neighborhoods. 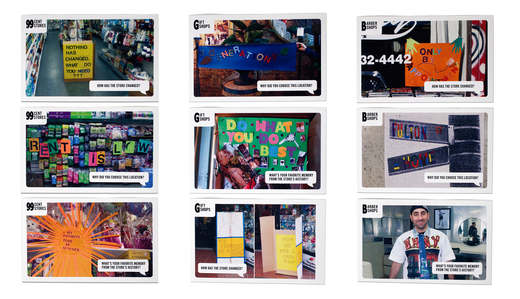 They took what they learned in these interviews and designed these story signs that visualize owners’ responses to questions about their stores’ beginnings, clientele, and evolution throughout the years.